Donald Clark Plan B: Big screen – big brain? Big screen – big brain? 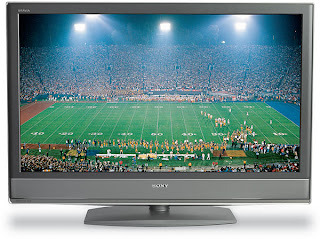 I remember the first time I saw a 42” Sony Bravio screen. It blew me away, even though I knew the shop demo was an HD DVD. I bought one and never looked back - I couldn't it's had me hynotised! TVs have become larger but the room size houses remains the same, and in modern houses is getting smaller, so the whole balance between screen and room tips towards the dominance of the screen. Your lounge becomes a cinema. The optimal viewing distance for a 42” TV is around 14 feet or well over four metres (3.5 times diameter of screen). The TV is therefore scanning the whole room like radar, sucking you in. DVD, HD and CD quality sound make it even more alluring. Only someone who doesn’t really like TV would now buy a small screen or those annoying people who are so very snooty about TV, games, the internet and anything else that comes through a screen (except the cinema - which they'll bore you on for hours). What’s interesting is the increase in ‘suspension of disbelief’, which is tangible, especially when watching movies. Interestingly, it also affects memory. In research by Nass and Reeves at Stanford (The Media Equation, Nass and Reeves, Cambridge University Press) 125 adults viewed segments showing a variety of scenes, on two different screen sizes. They concluded that picture size does affect memory. The bigger the screen the better the retention. Interestingly screen size also affected levels of arousal and their evaluation of the content, the larger screen eliciting more positive evaluations. What’s interesting here is the possibility that larger screens may significantly enhance the effectiveness of e-learning. It also has some interesting consequences for mobile learning, as the effectiveness of the learning, conversely, is likely to be considerably diminished. I notice this when I view pop videos or YouTube clips on iPODS or mobiles, they are nowhere near as watchable or funny on the smaller screen. Putting a large screen (not 42", more like 24") on a knowledge worker's desk pays for itself in 6 mos. to a year in increased productivity. I'm still waiting for head-mounted displays and beam-to-retina to catch on. I agree that big screens give you a very different experience and like you was seduced by the Sony Bravo though space restricted me to the 31"
A couple of points, resolution is just as important as screen size and rather more interesting the ability to work with multiple screens is one of the single most efficient things you can do to improve productivity. These days most laptops come with the internal laptop screen AND an external screen connector. Connecting a monitor to this connection and mucking around with screen properties allows most users to have twice the screen real estate. Anyone who wants to work with multiple documents, keep a calendar / browser/ monitoring application open while developing or writing will find this valuable however most laptop users are not even aware that this is possible let alone how valuable it is. So yes big is good, but more is better providing they are easy to drive. David Lynch would agree with you. Via Marc Andreessen's PMARCA, a sort of Silicon Valley version of Plan B. Well, almost. I work with dual 19" TFT monitors and it's a real downer having to go back to a single screen when I take my laptop out of the office. Assuming the your specific dev tool allows then it's great for previewing courseware or even doing a review against a previous and amended version. Just wish that b*oody Microsoft would allow spreadsheets to run in more than a singe window. Ahhh.. this reminds me my 14 year old TV has conked off. Kids fought and son yanked the cable inlet and the TV is dumb now. Was thinking of a bigger TV, maybe it's worth it. Used to watch movies on HBO and a bit of Discovery and Nat Geo but now all the time cartoons are on. Sigh I want a new TV! Are we outsourcing our memory?